My son, Oscar, is wearing the costume. He absolutely loves "Blaze and the Monster Machines" on TV. 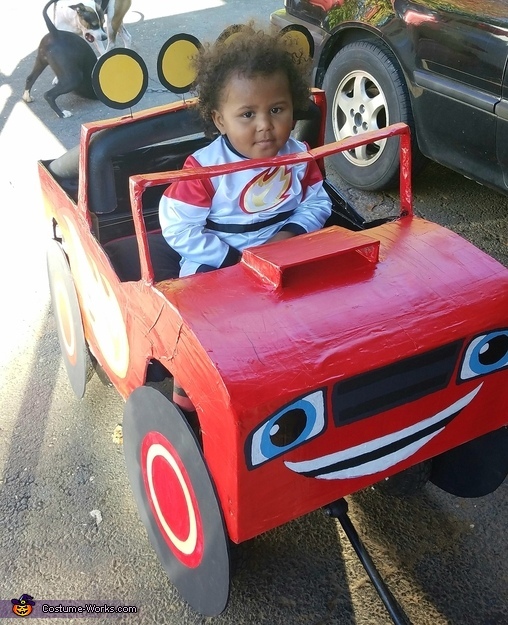 He is dressed up as "AJ", the driver, and i made a "Blaze" monster truck for him to ride in. It fits his wagon and the truck was very light so it wasn't hard to pull. I started with readi-board (thick foam poster board). I drew the sides, front, back, hood, by hand on the board and cut it out. I duck taped all of the pieces together to make the shape of the truck. To make it more sturdy I applied 5 layers of paper mache. After it was dry, i sprayed it with white primer, inside and out. Then I spray painted the outside red and the inside black. I used a sharpie to hand draw the eyes, flames, grill, and mouth. Then painted it with acrylic paint. I used the same kind of board to make the tires and lights ontop of the truck and painted them with acrylic paint. I used pool noodles to make the shocks and metal bars on back of the truck. I painted those with acrylic paint as well. His costume was made by a family friend. She used white, black, and red material, and an Iron-on flame.